Washington, DC—The Smithsonian’s Archives of American Art and the Terra Foundation for American Art today announced the launch of a new online guide to American art-related archival collections in the Chicago area. A $413,000 grant from the Chicago-based Terra Foundation supported a comprehensive survey of art-related archives in more than 75 Chicago-area institutions. This new resource has been published on an interactive platform on the Archives’ newly redesigned website. Complementing the survey are ten new oral history interviews with influential art world figures in Chicago, as well as extensive documentation of the Archives’ holdings of Chicago-related materials, also funded under the grant. This project is part of the Terra Foundation’s Art Design Chicago initiative, an exploration of Chicago’s art and design history and legacy taking place in 2018. 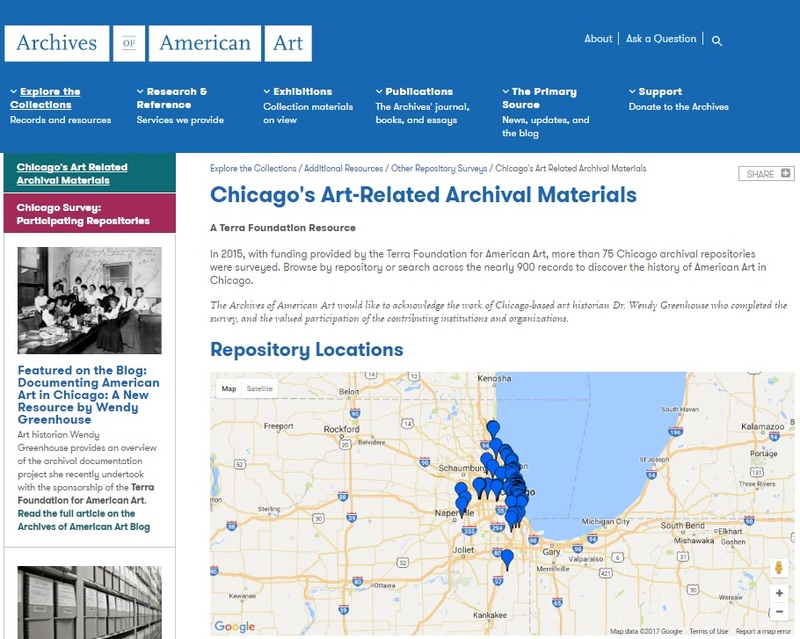 To improve access to art-related archival material in the Chicago area, the Archives engaged art historian Wendy Greenhouse to survey Chicago-area repositories and their holdings, to update the Archives’ guide Art-Related Archival Materials in the Chicago Area, originally compiled by Betty Blum. Published in 1991, the guide was the culmination of the Archives’ Chicago Documentation Project, launched in 1985. Listings were updated and expanded and collections in newer public repositories were added. “Much has changed in the quarter-century since the Archives published its guide in 1991,” stated Greenhouse. “New organizations and institutions with art-related archives have emerged—the National Museum of Mexican Art and Media Burn Independent Video Archive among them—and established collections have added such freestanding units as the Women and Leadership Archives at Loyola University Chicago and the Roger Brown Study Center at the School of the Art Institute of Chicago. This new resource will be an invaluable tool for anyone conducting Chicago-related research.” Available on the Archives’ website, additional digitized materials will be added when available. The platform is designed to accommodate future geographically based surveys, collection descriptions, oral history interviews, and links with open source and open data initiatives among other archives, museums, libraries, and other cultural heritage institutions. Another highlight of the project is the production of oral history interviews with ten influential Chicago artists, curators, and gallerists for the Archives’ renowned oral history program. Providing a window onto Chicago’s art scene over decades, the interviews yield a richness of detail, spontaneous reflections, and a sense of character not available in written records. Interviewees include Dennis Adrian (b. 1937); William Conger (b. 1937); Art Green (b. 1941); Theodore Halkin (b. 1924); Rhona Hoffman (b.1934); Ken Josephson (b. 1932); Vera Klement (b. 1929); Suellen Rocca (b. 1943); Franz Schulze (b. 1927); and Evelyn Statsinger (1927–2016). The Terra Foundation has recently announced Art Design Chicago, a wide-ranging initiative to explore the breadth of Chicago’s role as a catalyst and incubator for innovations in art and design. Spearheaded and funded by the Terra Foundation, with significant support from The Richard H. Driehaus Foundation, Art Design Chicago was developed in partnership with more than 40 cultural organizations to celebrate Chicago’s artists, designers, and creative producers. Focusing in particular on the period between the 1871 Great Chicago Fire and the turn of the 21st century, the initiative reveals little-known narratives of ingenuity and perseverance and provides new insights on Chicago’s enduring influence on fine and decorative arts, graphic and commercial design, product development, and film. Art Design Chicago will feature more than 25 exhibitions and hundreds of public programs, presented throughout 2018, as well as the creation of several scholarly publications and a four-part documentary. Founded in 1954, the Smithsonian’s Archives of American Art fosters advanced research through the accumulation and dissemination of primary sources, unequaled in historical depth and breadth, that document more than 200 years of the nation’s artists and art communities. The Archives provides access to these materials through its exhibitions and publications, including the Archives of American Art Journal, the longest-running scholarly journal in the field of American art. An international leader in the digitizing of archival collections, the Archives also makes more than 2 million digital images freely available online. The oral history collection includes more than 2,200 audio interviews, the largest accumulation of in-depth, first-person accounts of the American art world.